Speed reading isn’t the answer to a personal learning advantage. There are two things that most speed reading courses have in common: reduced eye movement and learning to skip unimportant words. If you’re just after reading more words faster, you can be a speed reader with no training right now. 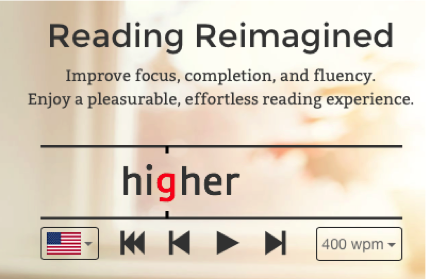 Spritz takes eye movement out of reading by centering words for you to read. You will be amazed at the Words Per Minute (WPM) rate you can achieve with Spritz. Are more words per minute what you really want or do you want to get more insights/knowledge per minute? Insights per minute (IPM) is a far better measure of learning. Let’s face it, most content has a lot of fluff in it. Why is every meeting an hour, every class a semester, and every PowerPoint about 30 slides? We put fillers in the dead space. In a classroom lecture you cannot speed up or slow down the instructor, but with audio and video recordings you can adjust the consumption rate to insight density. Did you know you can listen to Audible books at up to 3x the rate, Udemy classes at 3x the rate, and YouTube videos at up to 2x the rate (with the right player). That alone can double or triple the amount of insights you can consume in the same amount of time. So what is the fastest rate you can consume insights? That is really driven by the ABCs: Always Be Capturing, Connecting, and Compressing. That is how fast can you reasonably do something with the data (capture it and connect it to other ideas) and externalize your memory in a more compressed format (your notes). 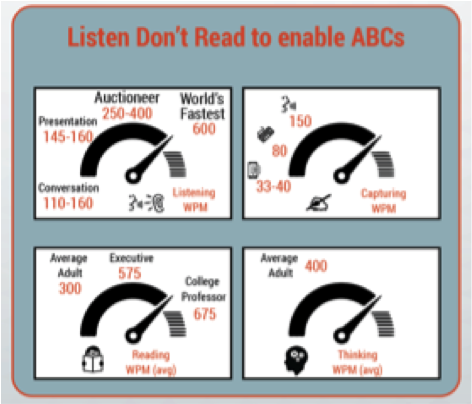 The fastest readers and speakers operate at over 600 wpm. Listening instead of reading has some huge advantages. It takes eye movement out of the equation (the biggest thing that slows us down). It frees your hands and eyes to capture and connect the information. Who doesn’t like to be read to? Speech recognition is one of the fastest ways to capture your thoughts. However, when listening you don’t need to capture at a high rate. You are summarizing remember. There is magic in being able to listen anywhere on a smartphone and take notes in real time. Of course if you are sitting in front of your computer a keyboard is a better choice. Having a medium like audio or video where you can adjust the speed of consumption relative to how fast you can capture insights maximizes your consumption rate. In our next segment we will show you other ways to increase your learning rate.